I put all my books into the "Books" container in the study above the bedroom and now I'm suddenly no longer able to access this container, nothing happens when I click on it. Help? Edit1: Loaded a previous save when the books are still there, the only thing I did inside the cave after that save, was talk with Hardly-Seen about weekly profits and that triggered an attack on the cave, by 3 Nords (? I think) an orc and another enemy waiting outside. Edit2: Played the fight triggered by the weekly profits topic again and as soon as I killed the last raider I went to the study and the books container is not working, so the issue is definitely caused by the raid trigger. The book container is scripted to sometimes trigger an attack on your base, if you know your way around the Cs a little bit, simple remove the script from the book container (as well as the hammer container). 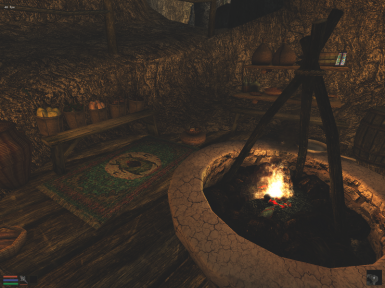 I've had some report of script related problems with OpenMW, though I am not sure this is one of them. I'm also not running OpenMW, so that's not it. I'd appreciate if you could tell me what I should try to do, I'm actually really new to using mods, so I'm pretty lost. I just took my books out the container before talking to Hardly Seen and triggering the attack. I just worry it might happen again but with another container and I won't have a previous close save to go back to. The mannequin disappeared for me. Is that a common bug? Do you meanthe practice dummy? It 'dies'and respawns like a creature. Hardly-Seen tells me that maximum profit from investing has been reached, and that it would be better to sell at this point. That's fine, but the "weekly profits" topic no longer appears at all; only the "weekly purchases" topic, and as such I am not getting any weekly profits anymore. I fixed it. In Hardly-Seen's dialogue, the conditions to show weekly profit for maximum profit (500 gold) is if aaProfitTimer = 0 and aaTHsmuggle < 375. However, if I'm reading the script right, aaTHsmuggle increases by various amounts for any contraband deposited and any smuggler boss killed without limit. Hypothetically, you could potentially increase this infinitely. My value for it was 422, so at the very least it can exceed that condition. Setting the condition to >=360 fixed the problem. Is there any console command to reset the "progress" for this mod? 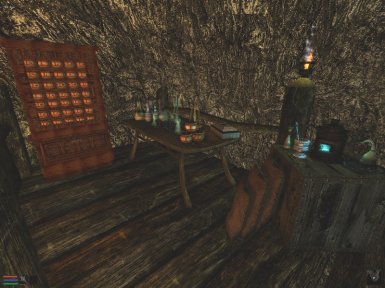 After getting back into Morrowind, I had a few bugs when I reinstalled this mod, namely duplicate doors (two doors in a single spot) and missing items (such as the books on the desk). Upon uninstalling it and reinstalling it, most of these issues got fixed and everything seemingly got reset, but Hardly-Seen still acts as though the place has been cleared even while she's in her original spot and there are still enemies around. ...Aaaand it seems to have fixed itself. New problem: Profits aren't added to the gold chest and no contract topic ever pops up despite it being mentioned in dialogue. There is no console command to reset the game :( Double doors and missing objects happen when a mod is modified mid play typically. I assume you check the chest right after Hardly-Seen told you about the profits? The contract topic usually appears after you talk about something else (that's how the AddTopic works). If your saved game still has variables and journal entries from before you re-install the mod, you are bound to have many issues as journal entries and variable control most of the scripts. Yeah, that's how I removed the double doors. Even then, no profits are appearing in the chest nor does Hardly-Seen have any contracts for me after mentioning them. There are some entries leftover in the journal just laying around, but the quest entries got reset (such as Adanumuran Reclaimed and Adanunuran Reclaimed: Under Attack!). Is there a way for me to set the mod's QuestStage/JournalIndex? Update: I went back and attempted to replicate when there were two doors. When that happens, there are also two chests and one of them has the gold in it. My guess is that, when using the "fixed" version that has no duplicates or missing objects, the game is still attempting to send the gold to that second chest. 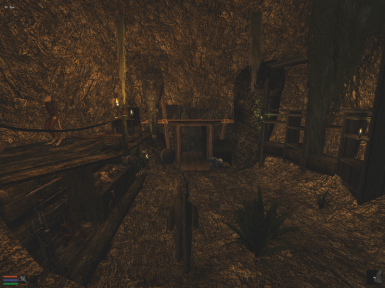 Update 2: I reinstalled the mod and repaired everything with Wyre Mash again. The profits now appear to properly go to the chest, but Hardly-Seen still hasn't given me any contracts. She just keeps telling me to check back with her, but I am unsure how uncommon these contracts actually are. Are they tied to a random period of time or future investments? Update 3: Contracts spontaneously started working for me. I am not entirely sure what happened, but I'll take it. Thanks for the help you provided. Following those steps with uninstalling and Wyre Mash again apparently fixed it, even if not immediately. Sadly I found very little time to mod and when I did I worked on mod requests. The update I was panning was very minor, a single room to add trophies. Okay , then I will just play it and report any issues I may find. Playing the plugin , from the outside I can't enter the cave aside from with the smuggler's haven item. Also sometimes my recall spell does not work well while I am inside and teleports me into the cave while my mark is set in Sadrith Mora. And a raid happend just before I finished clearing the cave , which seems odd as I could not enter the cave myself but the raiders seemed to and could find me as well , while I have not dealt in any contra brand items. Questions not issues : Are all smugglers in caves competitors and how do you know competition is going down ? And how much competition is there ? Which cities/places should I look around for for paintings ?Are paintings items found in chests or will they be on walls ? What do you mean with that stolen evidence is considered contra brand ? 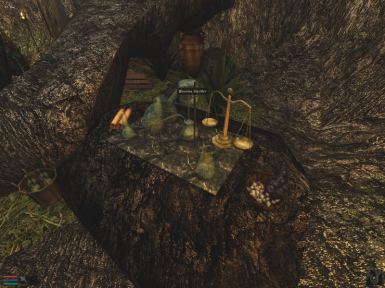 I used the alchemy sorter and it sorted my ingredients... but I can't find them in the cabinet. Is this a bug? I can move things in and out manually, but the little pots aren't individual activators. Thanks for clarifying! The pots are not individual activators indeed, there are a single container with the cabinet itself for all the ingredients. The glass door does nothing but open or close. Click anywhere on the ingredient cabinet to get your ingredients. Hope this helps. Hey, Danae! I LOVE this mod. I just encountered an issue though. I have maxed out my weekly profits but now the dialogue option for weekly profits has disappeared from Hardly-Seen. I can only do Weekly Purchases, and when I do those the "soul gem" option doesnt work. Any idea? That sounds like an issue, I'll have a look and make a hotfix until I get more time (or drive) to overhaul this mod. Thanks for letting me know! Really nice job, thanks! Enjoying the mod. 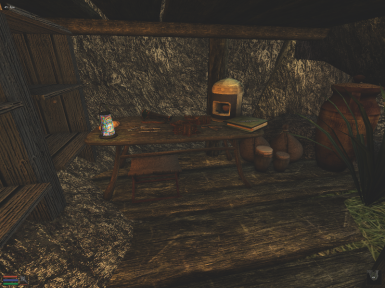 The only problem I got is that after one of the bandit raids, the book pile (located on the platform in the study room) stopped to be responsive. I cannot open it, a bit frustrating, as I have stored some books there. It has a strange script, maybe that's a reason? Thx for your help! Yes, the book has a script that triggers the raids. I definitely need to look at AR again and tweak a few things. Hopefully the Summer Modding Competition will give me the extra motivation for it. My Hardly-seen got stuck inside the cage and wont come out, could that cause some problems? There are versions of Hardly-Seen. The first one in the cage, will stay there until it is safe to come out. The second one appears in the first large room after you kill all the smugglers and she has all the dialogues for your smuggling business. She did initially apear in the large room but she just started walking in to the wall and ended up back at the cage when I wasnt looking. By the way the description of the mod mentions harvesting moon sugar but I dont see any option to grow it, is it something that unlocks later? The second Hardly-Seenis not meant to wander but as long as she has the dialogue options, you're good to go :) The Moon sugar is in the lab/workshop section, there are 3 (?) sugar reeds growing in a bucket. I am lock out of the cave after a raider showed up outside of it, I have try to coc my way in. Either I am doing it wrong or something else. What it the name of the lamp that lets you teleport there? Maybe I can just give it to myself. Never mind I just started a new game and tgm to go get the item id. Problem solved, I am glad because I love this mod. I have the same issue of not being able to re-enter the cave after leaving. A raider did show up outside too.